The trade between countries can be limited by enforcing tariff barriers and other restrictions (non-tariff barriers). A tariff is a tax on imports or exports. Most trade barriers work on the same principle: the imposition of some sort of cost on trade that raises the price of the traded products. 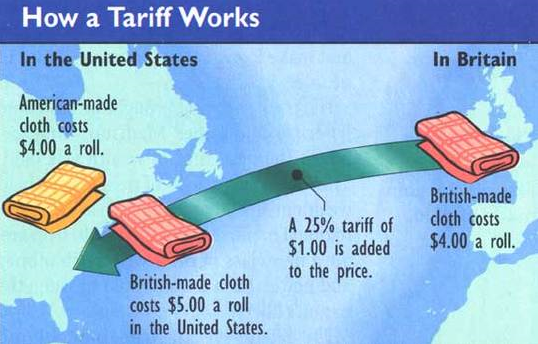 The trade between countries can be limited by imposing tariff. A tariff is a tax on imports or exports. 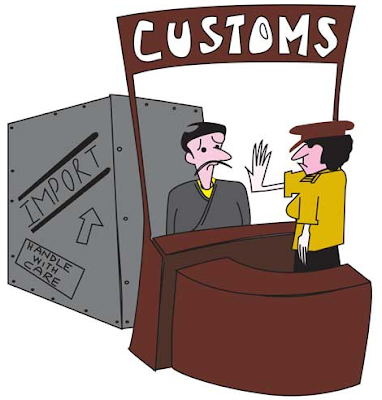 Tariffs are customs duties (tax) charged on imported or exported goods. Non-tariff barriers are all trade barriers that restrict international trade, but in a form other than tariffs. -Manufactured goods from LEDCs to the EU face a tariff of 30%. -The European Union may place a tariff on imported beef from the United States if it thinks that the goods could be infected with a disease. Japanese companies have located in the European Union to avoid tariffs, the EU do not apply duties if 60% of the components are made in Europe. Tariffs are often created to protect the domestic industries and developing economies, but are also used by more advanced economies with developed industries. The benefits of tariffs are uneven. Because a tariff is a tax, the government will see increased revenue as imports enter the domestic market. Domestic industries also benefit from a reduction in competition, since import prices are artificially inflated. Unfortunately for consumers - both individual consumers and businesses - higher import prices mean higher prices for goods.